The dreamy, feathery patterns on these cozy, soft scarves are woven using a special felting technique. 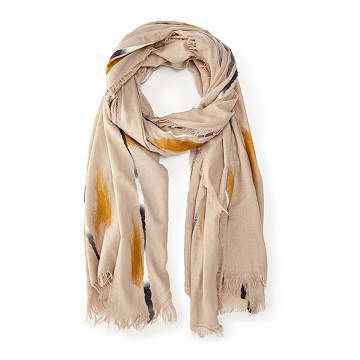 Feathery ribbons of felted fabric add striking color and texture to these cozy, super soft scarves. Woven using the "nuno" felting technique developed in South Wales, Australia, the scarves' designs are created by bonding loose fiber into the background fabric. Medium weight for crisp days, their patterns are dreamily reminiscent of rivers and clouds in seasonally colored landscapes. In blue or tan. Made in China.